TNPSC Group 2a Hall ticket download for group2a exam 2014 is now published in tnpsc (Tamilnadu Public Service Commission) Official Website. 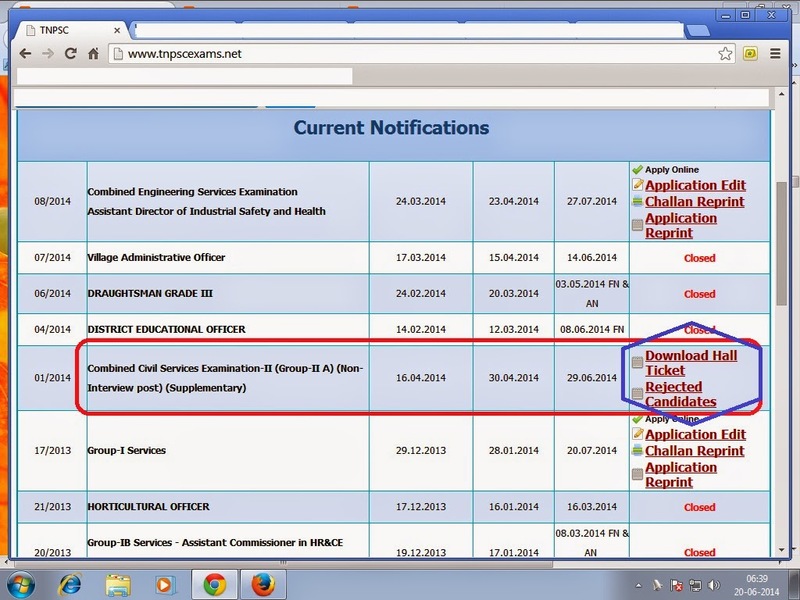 Also we give the link of tnpsc groupIIa exam hall ticket download. This recruitment of tnpsc gorup II A exam personal clerk and assistants posts. There are 2269 posts available in this tnpscgroup2a exam. selection of this candidates based on the group2a written examination scores. Note: Group2a exam candidates need not to attend oral exam. They will pass the group2 exam, they will get directly government post. In this exam no group2a exam admit card send via postal. only online download only available. How to download TNPSC Group2A Exam Hallticket. Check the CURRENT NOTIFICATIONS column. In this time Its available in 5th Row.